Situated directly off I-91 in the heart of downtown Springfield Massachusetts the newest Hampton Inn - Suites is within 0.5 miles of the MGM Springfield Casino blocks from the Basketball Hall of Fame and the MassMutual Center and walking distance to several fine restaurants including Max*s Tavern Pizzeria Uno Plan B Burger and more. Spend your day at close by Six Flags New England or take in the many events at the Big E and Eastern States Exposition grounds each within an easy 10 minute drive. In addition our central location provides easy access to major businesses universities and colleges such as MassMutual Insurance Steel Partners Smith - Wesson Springfield College Western New England University American International College and the University of Massachusetts. Each morning of your stay savor Hampton*s free hot breakfast featuring our famous fresh-baked waffles. If you*re heading out early we offer a quick healthy breakfast and a bottle of water - all packed in a free Hampton*s On the Run Breakfast Bag /Monday to Fridays/. Our contemporary 550 sq. ft. conference room is ideal for board meetings and training sessions for up to 25 people. Print your flight boarding pass or check emails with free WiFi in the business center. Exercise in the 24-hour fitness center or swim in the heated indoor pool. 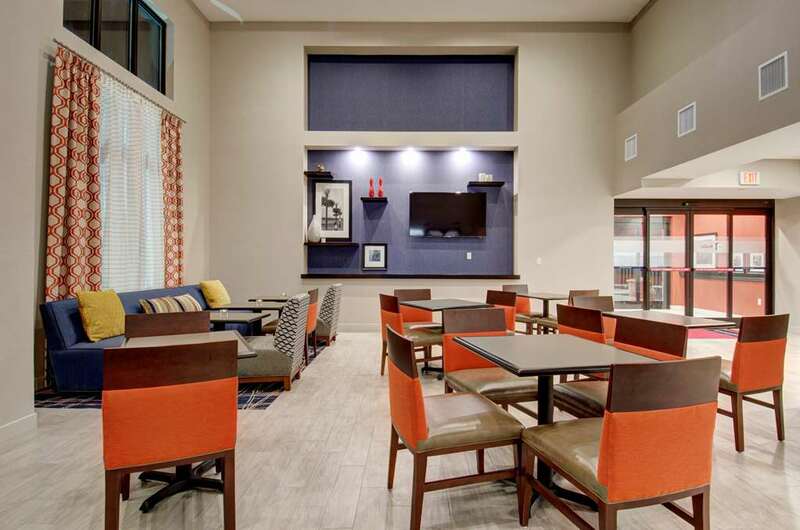 Retire to your comfortable and spacious guest room or suite equipped with a clean and fresh Hampton bed free WiFi a flat-screen TV and a generously sized workspace. There*s always a friendly face and free tea and coffee in the lobby 24/7 should you need some advice on things to do in Springfield MA.